Sunday seems to be our go-to pizza night. 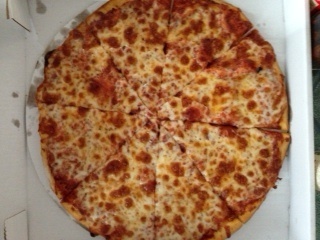 I’m especially fond of a super thin crust specialty pizza, a glass of wine and The Amazing Race. 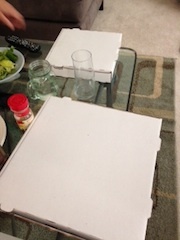 But even when The Amazing Race isn’t in season, like now, pizza is still always a viable Sunday night option (or Thursday night…or really any night, but particularly Sundays and Thursdays). Coming home after a long drive from “Up North” the last thing we wanted to do was get in the car again to go pick up food, so we took the opportunity to try another Ann Arbor pizza spot. This time, we went for Anthony’s Gourmet Pizza. It had some good Yelp reviews, so I guess it was about time for us to try it. Going into the order, we knew that deep dish was their thing. Not all the Yelp reviews were specific as to what was ordered, but generally good reviews could span all dishes (one would hope unless otherwise noted by said reviewer). They do have all sorts of crusts. And by all sorts, I mean one “New York style” and a million thick crust styles. Again, I was unaware that 1. 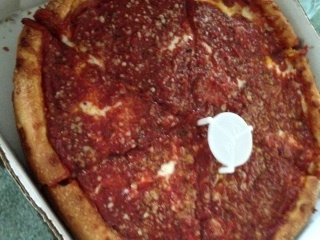 Chicago style stuffed pizza, 2. Deep Dish, 3. Sicilian Deep Dish, 4. “Round pizza” (which says is “traditional” but sure looked thick to me on their website) were all different. I’m pretty sure I thought those were all the same. I just wanted a normal cheese pizza so I got the New York style. Mark wanted to try a pan pizza (is that an even different style? I will have to investigate, but for now I’m using that as a synonym), so he ordered a Chicago style. The guy taking the order asked if this was our first time ordering from them, and when Mark said “Yes,” he said, “I thought so” and encouraged us to scrap the Chicago style in favor of the Deep Dish which is their “signature dish” (pun intended). I’m typically not a fan of deep dish pizza, and I completely concur with Jon Stewart’s assessment that “it’s not pizza…it’s a…casserole.” And I was highly amused by the comparison of deep dish pizza to “tomato soup in a bread bowl.” But the guy at Anthony’s was correct in suggesting we try their signature pizza. While it did indeed have a crust as thick as a two-by-four, the pizza was flavorful and satisfying. Two tiny pieces were plenty. It was definitely greasy, and you absolutely had to eat it with a knife and fork like a quiche or something, but I would eat it again if I had guests over who preferred deep dish. The crust was meh, but that’s probably just because I don’t like how there was so much of it. The texture was kind of like focaccia bread and I actually really would have enjoyed it with rosemary and sea salt. Maybe they should offer that as an option! So on to the thin crust. Here was the real disaster: greasy, yet somehow dry at the same time, with zero flavor. Zero. It’s been days – DAYS – and there is still 75% of a pizza sitting in the fridge. That’s unheard of. It looked delicious from afar, but upon closer inspection, it kind of looked like the pizza you would get at the snack stand at the pool (i.e. literal cardboard crust)…although that pizza is kind of delicious after a long day of swimming. I guess the thin crust is really and truly NOT their signature dish. Lesson learned: always trust that restaurants know what they do best and just order that. Should we have been tipped off by the fact that the boxes were plain white? What pizza delivery place has plain white boxes? Weird. Verdict: good at what they say they’re good at, just not my jam. Am I really writing a pizza review about Domino’s? Well yes, yes I am. Did you know that Domino’s is headquartered in Ann Arbor and the first store was down the road in Ypsilanti? Now it makes more sense. I hadn’t had Domino’s in a few years but always enjoyed their thin and crispy crust while in college, so when fellow Ann Arbor food blogger The Food and Wine Hedonist told me that it was probably his family’s favorite pizza, I figured I should give it another try. Last week I ordered a thin and crispy with banana peppers and a “Brooklyn-style” with pepperoni. Both were pretty good, but I definitely enjoyed the Brooklyn-style crust more. This more “traditional” NY crust was introduced by Domino’s in 2006, and they tout it as “large and foldable.” Obviously this speaks to me. 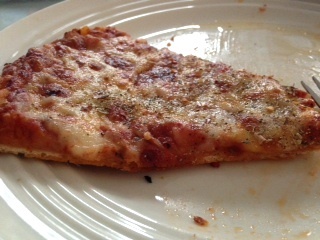 The thin and crispy was good too, but I did find the super smooth crust bottom a bit disconcerting….a slick bread product doesn’t seem like the correct texture for pizza. Maybe if they had roughed up the bottom somehow. As I had been told, one of the best parts of the Domino’s experience is their online ordering feature. It was a super simple process of customization and couponing, and once you’ve hit submit, a cartoon pizza maker rings the cash register and starts prepping your pizza. A real-time index shows you where in the pizza-making process your pie is, and it tells you the name of the person doing the work. For instance: “Jim is now putting your pizza in the oven.” “Your pizza is now cooking.” “Tom is now in the car delivering your pizza.” And then the doorbell rings. It’s Tom with our pizza! Fantastic! It’s all a bit cheesy (no pun intended) but fun and makes the time fly by as you check in to see pizza-status updates. All in all, I quite enjoyed my hometown Domino’s experience and would definitely get the Brooklyn-style crust again. It’s finally warming up a bit here in MI. I didn’t wear a scarf and sweatshirt under my full-length down-comforter-slash-sleeping-bag-slash-coat today. But two weeks ago, this was hardly the case. I know it’s cold elsewhere, but really I’d never experienced temperatures like this. I woke up one morning to a bright blue, cloudless sky. 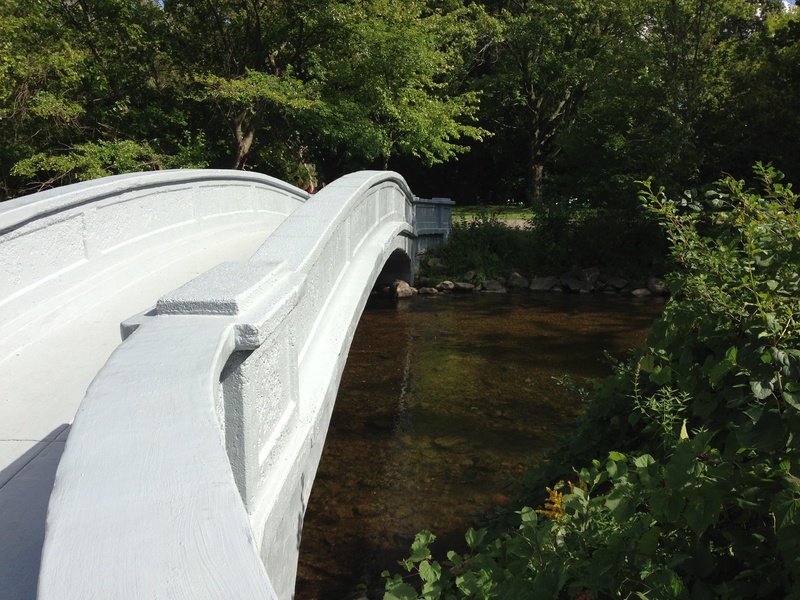 It was so sunny and beautiful, I thought maybe I’d go for a walk! I checked the temp: -6. NEGATIVE SIX. Hm. Two hours later it had gotten up to 0. Zero degrees. It had gotten up to zero. No. So when Mark asked me if I wanted to come downtown for dinner out (yay a chance to try a new restaurant) or stay in with pizza, it was a tough call, but not that tough: stay in please! It was tempting to fall back on a pizza place we had already tried and knew we would be satisfied with, but we decided to branch out. The place we chose was called Pizza Pino….Pizza Pino, Pizza Pino, why is this name sticking in my head? I can just hear my dad enthusiastically shouting, “Pizza-Pino!” over and over again. Is there a Pizza Pino we used to go to? Long Island? New Mexico? I will do some research. 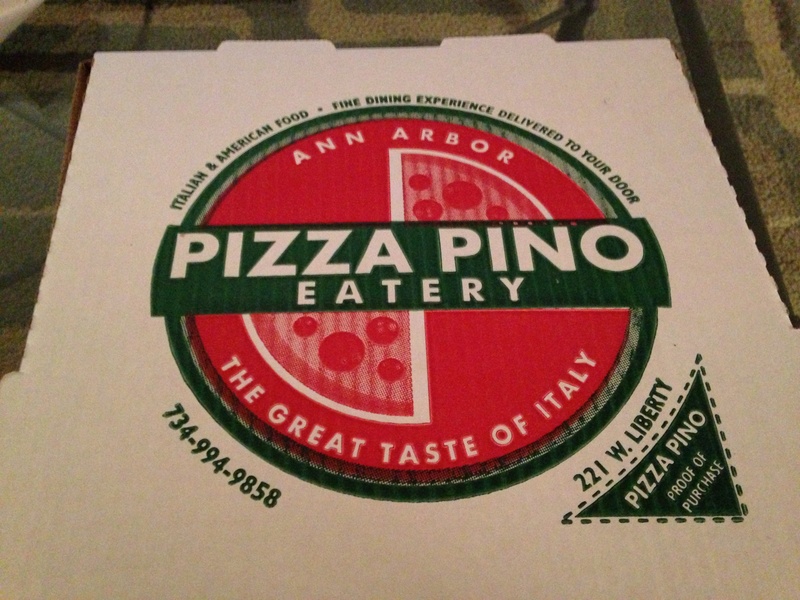 With that memory in mind, I had a good feeling about Ann Arbor’s Pizza Pino. 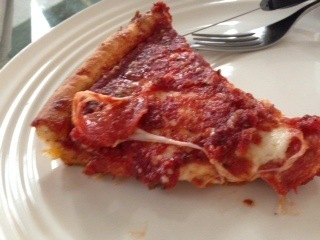 I got a thin crust (I don’t know whether it’s a good or bad sign that a lot of places here have a range of crust choices from extra thin to Chicago and deep dish – which apparently are two distinct crust types….maybe I will make a Linnaeus System of Crust Classification. You know: Kingdom, Phylum, Class, Order, Family, Genus, Species. Although mine will be the Lowe System and have many fewer levels. The choice is good if you don’t like a particular crust-type, but can they really do all those crust-types well? TBD.) ANYWAY…..I got a thin crust pesto chicken pizza (you know I love a good chicken pesto), which involved pesto (obviously), tomatoes, chicken, spinach, mushrooms (that was a new and welcome twist), and mozzarella. My gold standard for chicken pesto pizza is obviously Bagby in Baltimore as I have discussed many times over. I have also discovered that Pizza House here in Ann Arbor makes a good version, however I later uncovered that their extra thin crust is made on a tortilla, not an actual crust. I don’t know how I feel about this. On the one hand, I couldn’t tell when I first got the pizza. On the other hand, now that I know….I guess it doesn’t matter. Fine. 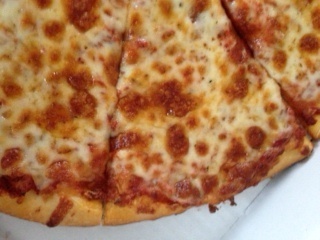 The pizza was delicious – just a little bit salty, with a stiff crust that held up the plethora of toppings. I’m a big fan. Whereas other “specialty” pizzas sometimes are more like flatbreads with just a sprinkle of cheese, this was a traditional pizza in the sense that it started with a good cheese pizza and added the toppings to that (although remember no tomato sauce, as this is replaced by slices of tomatoes). I also enjoyed the fact that the tomatoes were sliced and not diced since sometimes diced tomatoes feels more like salsa in your mouth. The sliced tomato is a more expected texture I guess. I would definitely get this pizza again or try one of their other kinds. Oh, and by the way, I looked up Pizza Pino, and I found one in Paris, which is where I think my Pizza Pino memory developed on vacation as a kid when all my sister and I would eat was pizza and ice cream. Yum! After our pizza bust at Tony Sacco’s (which you can read about here), we ventured across the street to another strip mall, which houses Bella Italia Pizza and Pasta. Mark had heard about Bella Italia from his coworkers, who recommended the New York style pizza joint that also sells pizza by the slice (always a good sign). We got two slices of pepperoni that looked like good NY-style za, however it also looked like it had been sitting out for quite a while. I don’t know for sure, but perhaps this place is more of a lunch establishment – they did look like they were cleaning up and shutting down shortly when we arrived around 8:30. I, being full from dinner #1, didn’t partake in the Bella Italia slices, but Mark seemed to enjoy them. I’ll have to pop over one day while running errands to try it for myself. Narrowly tucked into the strip mall, Bella Italia reminded me of a old-school cozy pizza parlor. Long counter to one side with pies lined up in the case to be reheated in the giant steel pizza oven for sale at the register. The other side lined with sticky-plastic booths with framed pictures of Italy on the walls. The front windows were fogged up from the pizza steam. Bella Italia is known for its pizza challenge: 30 inch pizza, 3 people, 30 minutes. If the eaters succeed, the pizza is free. They keep a tally on the chalkboard behind the register. So far only one team has completed the challenge in 2014 (as of a few weeks ago). I believe there were three or four teams in the loser column. You have to call ahead to arrange the challenge, so they can make the pizza specially. Assuming the pizza is delicious, let me know if you want to form a team. I’m definitely good for at least a third. Unfortunately I didn’t take any pics of those pepperoni slices, so you’ll have to take my word for it that they looked like normal New York slices. Mark and I had a pizza hankering a few weekends ago, and wanting to try some place new, we decided on Tony Sacco’s coal-fired pizza. Tony Sacco’s is a chain with establishments in the Midwest, Florida and North Carolina but that didn’t deter us because some chains (like Bertucci’s) can be really good. We had driven by Tony Sacco’s many times when shopping at Whole Foods, as it’s located in that strip mall’s parking lot, and always wondered how it was. The restaurant atmosphere wasn’t anything special: standard large room with granite tables and typical black metal slatted-back chairs as you find in many pizzerias. Nothing on the walls to make it homey or charming, but there were some TVs if you wanted to go there to watch a game. What I did notice was that the tables were kinda long and skinny, so that Mark and I were abnormally far away from one another. I probably only noticed this because I recently read restauranteur Danny Meyer’s book Setting the Table: The Transforming Power of Hospitality in Business, in which he describes specifically picking wider tables that were shorter in length so guests would be closer to one another across the table and could speak more intimately without shouting. So that was one odd distinguishing feature of Tony Sacco’s. Mark and I each ordered a personal pizza, and personal they were. On the small side, it was enough for me, but Mark was still a bit hungry after his pepperoni pizza….more on that in a minute. 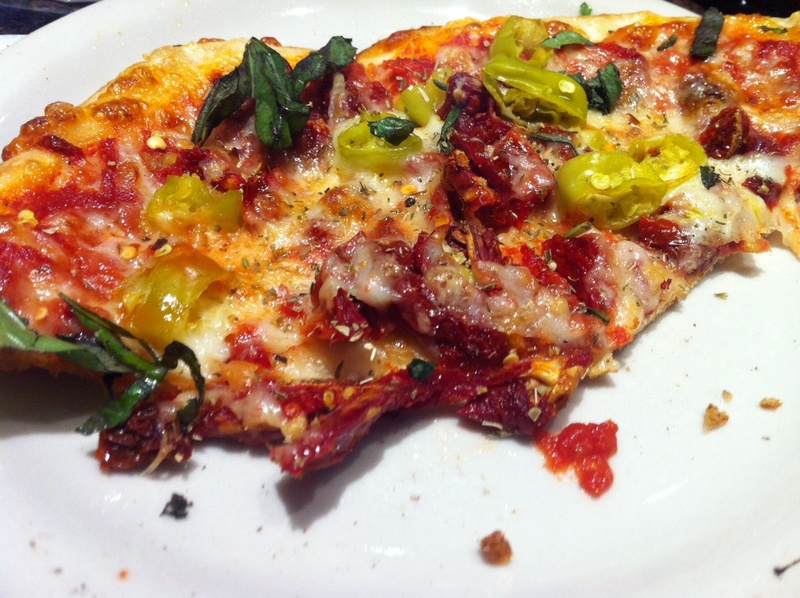 I had a sun-dried tomato and banana pepper pizza, which was fairly tasty. They definitely did NOT skimp on toppings, which was appreciated, however we did remark that the toppings really gave the pizza flavor, whereas a plain cheese pizza without toppings probably would have been bland. They also put some sort of added butter or oil on the crust, which was unwelcome. The crust texture was well enough, but whatever they spread on there at the end just added grease and no flavor. At least if you are going to add all these extra butter calories, make it like Papa John’s garlic butter goodness. I feel like this “butter on the crust” thing is a new trend that I’m seeing in a lot of pizza commercials, and I don’t like it. Your crust should be delicious enough that you don’t need to slather it with butter. If I see you putting extra butter on your crust (of stuffing the crust with cheese for that matter), all I’m thinking is that your dough is sub-par and I probably should avoid your establishment all together. Just sayin’. As I mentioned earlier, Mark was unsatisfied after his small personal pizza, so we decided to go elsewhere for our second pizza dinner of the night. Part II to come. Happy New Year! Time to start it off right with new pizza! The other night we tried Bigalora wood-fired pizza. Bigalora is the newly opened reincarnation of the existing Pizzeria Biga restaurant that I never had the opportunity to try. Bigalora in Ann Arbor (there are a few others in Southeast Michigan) is situated at the far corner of the upscale Arbor Hills strip mall (apparently “upscale strip mall” is not an oxymoron), which includes some new-to-Ann-Arbor stores such as lululemon, Brooks Brothers, J. Jill, Paper Source, Sur la table, North Face and Blue Mercury. The restaurant interior was wide-open with a lofted second floor towards the back creating a two-story ceiling over the main dining room. Despite its exposed duct work and huge glass front wall, it was surprisingly cozy, anchored by a slate-colored wrap-around bar behind which was a towering wall of spirits. There’s a sliding ladder for the bartenders to climb to reach the upper shelves – love that this is reminding me of an English manor’s mahogany library only done in metals and glass! Those throw-back, exposed-bulb pendants generated an orangey glow over the bar and cream fabric-covered, doughnut chandeliers above the dining area created a soft, warm atmosphere. The culminating touch was a lounge area in the front of the restaurant that was both rustic and modern: circular, hammered-copper coffee table, tree stump side tables, and then to throw some chic into the country-living vibe, lucite (or just regular clear plastic?) high-backed arm chairs in the style that you might expect of a tufted leather reading chair (again perhaps in an English manor’s library), only much less comfortable. And everything sitting atop (or in the case of the chairs, floating atop) a large calf-skin rug. It was a welcoming arrangement that made me really want to take a seat and drink an Old Fashioned by candlelight. I would definitely return to dine in. As it stood, we had ordered carry-out, and probably just as well because the place was packed. I got a simple margherita pizza; Mark got wood-fired chicken wings and a pepperoni pizza. 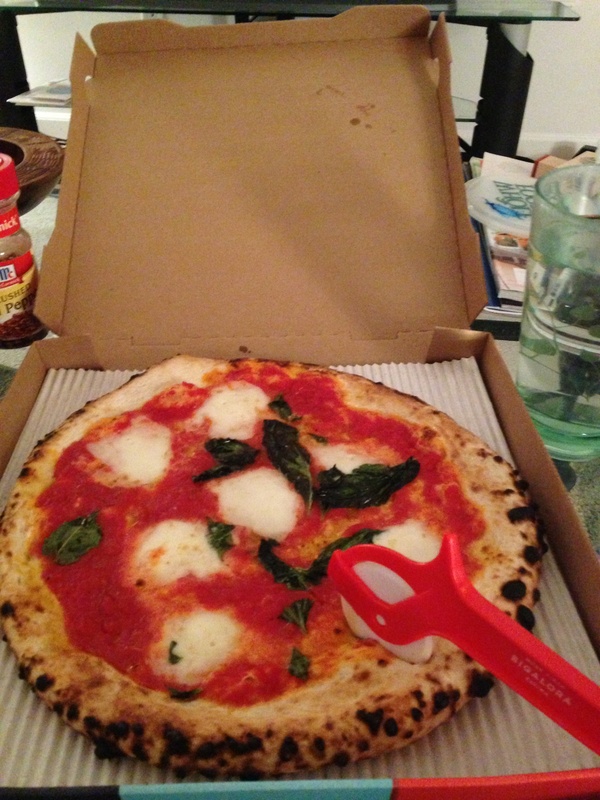 Everything smelled delicious in the car ride home, and I was childishly excited about the red plastic pizza cutter they included with our order (which turned out to be necessary since they don’t pre-slice the pizzas…it was incredibly effective…maybe more so than the metal cutter I have from Target). 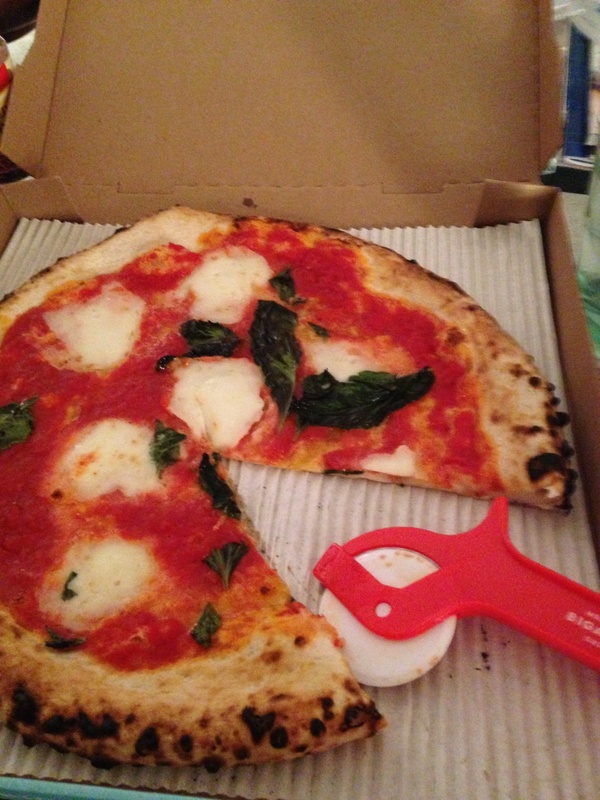 My margherita was light with dollops of fresh mozzarella and whole basil leaves. The sauce (maybe a bit oversauced in places?) was brightly acidic and slightly sweet but not overwhelmingly so. Everything meshed very well. The crust was super soft and chewy with a char around the edges. I’m not usually over-enthusiastic about an extra chewy crust, however this time it worked as it was quite airy, not dense, and acted as a counterbalance to the super-thin crust sitting underneath the toppings. The wings were also a hit: wood-roasted, non-breaded, served with sweet roasted onions – different and delicious! I didn’t try Mark’s pepperoni pizza (each pizza is definitely one-person-sized), but it looked good and it’s gone so that must say something. I’m excited to go back to dine in and explore the menu more fully. Happy eating! In order to start meeting new people in my new town of Ann Arbor and schedule some activities for myself, I decided to volunteer as an advisor at the University of Michigan chapter of the sorority I joined at University of Maryland in undergrad. I emailed the chapter advisor out of the blue after finding her contact information on the chapter’s website, and we met one evening at Panera for coffee and to discuss opportunities. She has been leading this chapter for about 14 years, has a great depth chart of other advisors, and was super enthusiastic about getting me involved right away, which was very welcoming of her. After getting current on my alumnae dues (oops), I attended my first Monday evening chapter meeting the following week, where I met the president and some of the other advisors. I’m going to be helping the vice president of campus activities, which is a newish position that we didn’t have when I was in school or when I was the chapter advisor at Towson University back in Maryland, so it will be a learning experience in duties and responsibilities, as well as getting to know a whole new (very large) group of collegians. Right away I was energized to start sharing ideas and asking questions about how this chapter operates differently than the others with which I have been involved. There are over 200 members, and the new member classes are almost as big as the entire sorority at Towson. Clearly, things operate differently here. For instance, whereas initiation ceremony was mandatory for all sisters at Towson, it logistically cannot be mandatory at UMich because the whole sisterhood can’t even fit in the chapter room together at one time! I learned some interesting tidbits that first evening, both about the sorority and Ann Arbor, not least of which was that I should definitely try Pizza House. The sisters and the advisors all agreed that Pizza House was delicious, and I was told that professors often place orders here when they are having lunch meetings for large groups. Interesting. Especially because their website lists their specialty as Chicago deep dish (not my fav). Reading the menu further, I saw that they also make thin and super thin crust pizza; they also have an enormous selection of pretty much all other food you could ever want: salads, sandwiches, burgers, Italian favorites, Chipatis (which I’ve heard are just an Ann Arbor thing…a pita pocket filled with salad), wings, desserts, and on and on. Willing to take a chance, I placed a dinner delivery order of a thin crust pepperoni pizza and a super thin crust chicken pesto pizza. They said it would take 30 minutes, so I was shocked when 15 minutes later the doorbell rang, catching me completely off guard (also because they came to the garage door and not the front door…I’ve never known a garage door to have a doorbell before). The pizza was delicious!! Yay!! “Delicious” is so overused, but it really was. The thin crust was good thin crust; like your standard pizza: not too bready on the bottom and a regular thickness to the outside crust. Could have been a little chewier crust, like that good yeasty NYC crust, but okay, that’s just hard to find in general. The super thin crust was excellent. 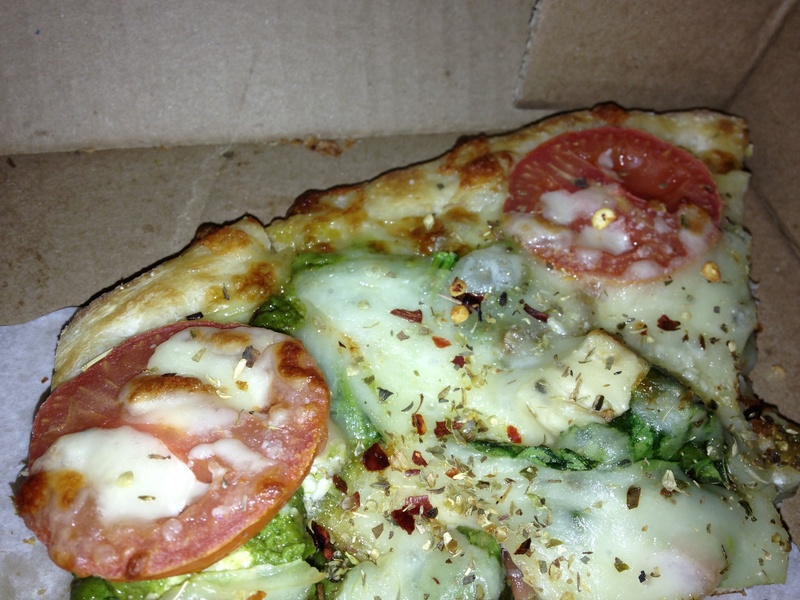 I loved the chicken pesto flavors: chunks of chicken, basil pesto sauce, red onion, diced tomato and gooey mozzarella. Of course, you always love what you know and what you grew up with, and you’re not likely to love something new more than something old that’s held on a pedestal and to which you are comparing the new thing, but I gotta say that this measured up pretty close to my beloved Bagby chicken pesto pizza back home. The crust was perfectly salty, not overdone or buttery, just like a nicely salted cracker. Which isn’t to say that the crust was cracker-like, because it wasn’t that hard and crunchy. It was soft underneath the toppings (maybe I would ask for a little less cheese next time to avoid a bit of sog….I know, I know, less cheese = blasphemy, but sog is unappealing) and crispy at the edges. I also liked how the toppings came pretty close to the edges. Next up: Pizza Bob’s. I got a recommendation from a friend who went to grad school in AA. Although she said she’s never had the pizza, she said the milk-free shakes and chipatis were yummy, so I’m hoping that carries over to the pizza too. As for getting back into sorority volunteerism, I’m enthusiastic about dedicating some time to an organization that promotes women leadership, teamwork and friendship. I still have yet to find my go-to pizza spot in Ann Arbor. In fact, I’m getting fairly frustrated by the lack of thin, crispy-crust or wood-fired oven pizza that doesn’t make me feel totally bloated and sleepy after eating it. 2. Mani: Mani was rated as one of the top 38 places to eat pizza in the US by eater.com. The pizza was good if you are eating in and having it to share, but certainly not crave-worthy for our-weekly-pizza-night-at-home-on-the-couch routine and I’m pretty sure there are 38 better places to get pizza in NYC alone. 3. NeoPapalis: I would definitely recommend eating in over taking out and the margherita pizza over the traditional cheese for a lighter take. I would also get one of their huge, fresh salads to fill you up with something healthy in addition to the pizza. 4. Grizzly Peak: Pretty cheesy and would try it again if eating at the restaurant but not going to be a go-to for carry out. 5. Hello Faz: What an odd name for a pizza place….or any place. We decided to look for a restaurant that would deliver pizza to us, and this was very highly rated on Yelp. 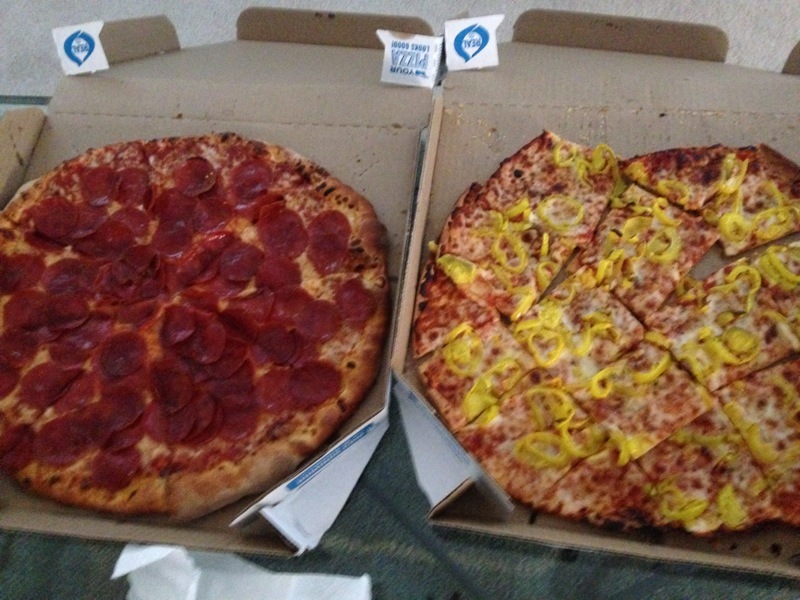 We got a half cheese-half banana pepper pizza and pepperoni cheesy bread. With the first bite of cheesy bread, I got the overwhelming taste of pretzel – yum! It wasn’t until the next piece that I realized the pretzel taste came from the copious amounts of butter spread underneath the cheese. It was reminiscent of Auntie Anne’s pretzels. The pizza was super bready – almost more so than a Papa John’s, which is really saying something. The banana pepper side was decent because the sourness of the peppers broke up the salty, extra-chewy crust/bread, but the cheese side was fairly overwhelming to try to chew. It could have been the pizza, or the week-old-opened white wine I had with it, but either way I felt so sick the rest of the night, and the next morning was even worse. I think it was really all that butter. We had about half a pizza left over, and I didn’t even want to look at it the next day, let alone have it for lunch. Needless to say, I will not be getting Hello Faz pizza again. So the quest continues for Ann Arbor pizza. Okay, so there are tons of pizza places in Ann Arbor (although someone did warn me that there weren’t actually any good ones) – somebody please tell me where I can find a yummy, gourmet, wood oven pizza in this place! I can’t say I’ve been to Walmart all that many times in my life. I think my dad used to go there to stock up on bulk water before Sam’s Club opened and you could get “a liter of Pelligrino for 50 cents! It’s at least $4 on the boat!” (Reference to expense of purchasing water on cruise ships.) So I probably went a few times with him growing up. There was a Walmart in Baltimore. I think I went there once in my entire life – to get a softball glove. 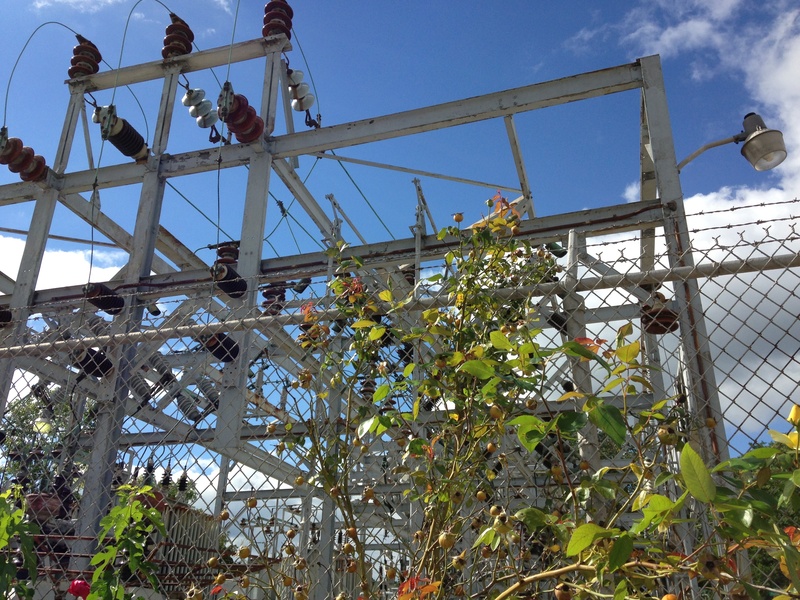 The Walmart in Baltimore was only to be used as a last resort – in an emergency. From what I can remember, it’s fairly chaotic inside. Opened boxes, contents strewn across the shelves, sketchy characters loitering inside, and outside in the parking lot. As an example of the mayhem around the Baltimore Walmart, I offer this anecdote: I was awoken from my slumber early one Saturday morning by a woman asking if I knew a “Mike.” I groggily answered, “Wrong number.” She called back, and not accepting my “Wrong number” again, proceeded to agonize about how she had bought this phone at the downtown Walmart but all the speed dials had already been programmed and my number was in there listed as “Mike” so I needed to tell my deadbeat son Mike that his friend should not purchase a phone, use it and then return it to Walmart. I was so confused at this berating. After ten minutes of trying to assure her that I didn’t have a son named Mike and that she should probably just take the phone back to Walmart, Mark stuck his head in the bathroom where I was trying to talk quietly so as not to wake him and just said, “Hang up.” Oh right…what a novel idea. So I did. I didn’t pick up as she continued to call over and over again. Until she must’ve given up. We did what we had to do that day, but last week, I went back to Walmart to purchase some items that I couldn’t find in Target, including right-sized bar stools, poster frames and a generic printer. On this second trip, where I really had a chance to wander the aisles and dig into what was truly being offered beyond the flashy front-of-store displays, I noticed a real lack of furniture items, for instance. And they only had nice photo printers, no cheapies. And none of the frames fit the pictures I have. Severely disappointed, I thought, well at least I can do my food shopping while I’m here. I had written up a list of staples and fresh food that I needed for the apartment. My first grocery shopping trip in the new place. I should’ve known better than to do it at Walmart. Why had I let down my Walmart guard? Oy, the frustration. I came away with a good amount of paper products, dry/frozen goods and beer, but not much in the way of really delicious-looking produce or meat. I was tempted by some ears of corn, but then I realized that there is a farmer’s market on Wednesdays and Saturdays, which is a ten minute walk from our place, so I was probably better off going there. Walmart is now back on the banned list. Done. Switching gears entirely, I did try a new pizza this week! I had the portobello and spinach pizza at Grizzly Peak Brewing Company. The bar itself is great – cozy with all their own beers on tap. I had a very refreshing and interesting beer flavored with a lot of ginger. The pizza hit my salt craving with kalamata olives and feta, however there was a bit too much mozzarella that weighed it down. Between the mild flavors of the mozzarella and the portobellos, I definitely needed the crushed red pepper to zing it up. I could have seen this pizza with less mozz, more feta, and instead of lemon-infused oil (no sauce), perhaps a garlicky pesto. The crust was good – but I preferred eating it on its own rather than slice by slice. Chewy and slightly sweet – almost reminded me of a good breadstick. Saturday we went to the first UMich football game tailgate of the year! It was a bright sunny day, and we had a great time getting to know Mark’s coworkers and their families and friends. We didn’t actually go to the football game, but we took a leisurely (read: 45 minute) walk back to the apartment, where we promptly took a nap. 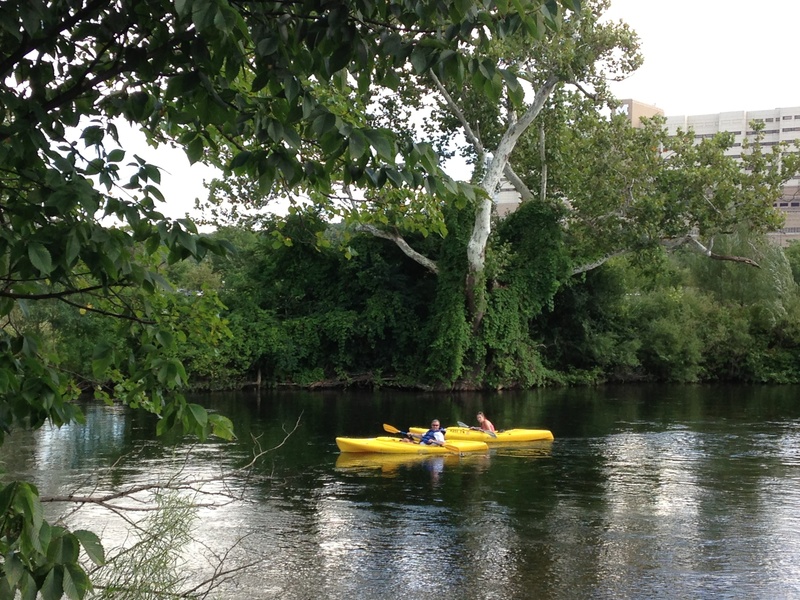 Sunday, we decided to get outside and do something active in nature, so we went to the Argo Park Livery to rent kayaks. The shop is run by the local government and they don’t take reservations, but luckily we got there early and it was a bit overcast, so the place was pretty empty (not so much when we got back there about 2 hours later when the parking lot was jammed). 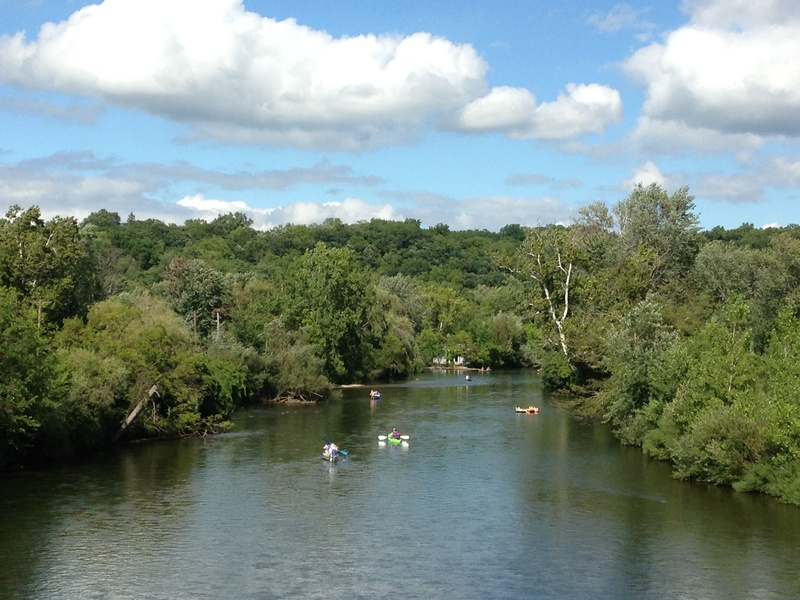 Kayaks were $18 each to rent for an hour and half, while floating/paddling down the Huron River to Gallup Park, where the company picks you up in a van to take you back up river. You start off going down 9 cascades – little drops – some of which feel like you’re popping out of a drainage pipe – fun! Then the remaining hour and fifteen minutes is spent meandering down the river, alternating between letting the tide take you and doing some heavy paddling (especially at the end towards Gallup Park where the water becomes quite still). 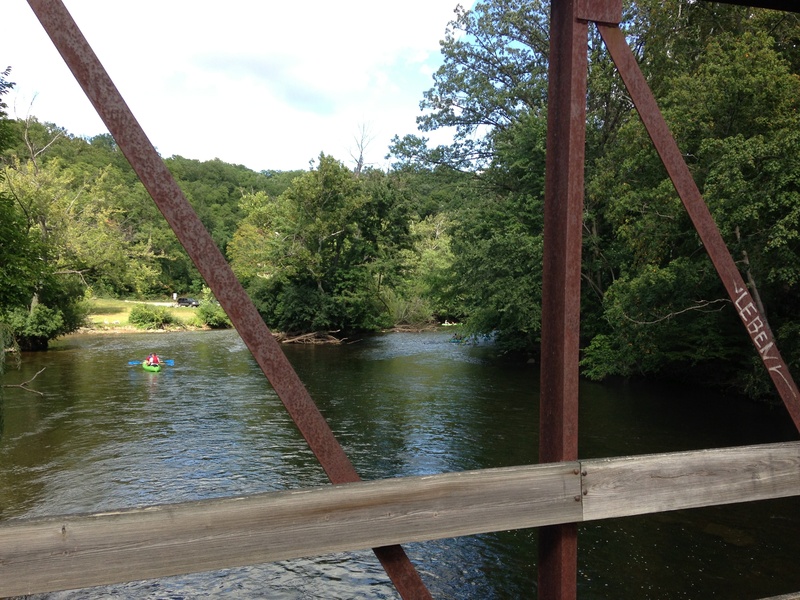 It was a relaxing and delightful trip – we spotted a groundhog, geese, at least three blue herons, and lots of fish. 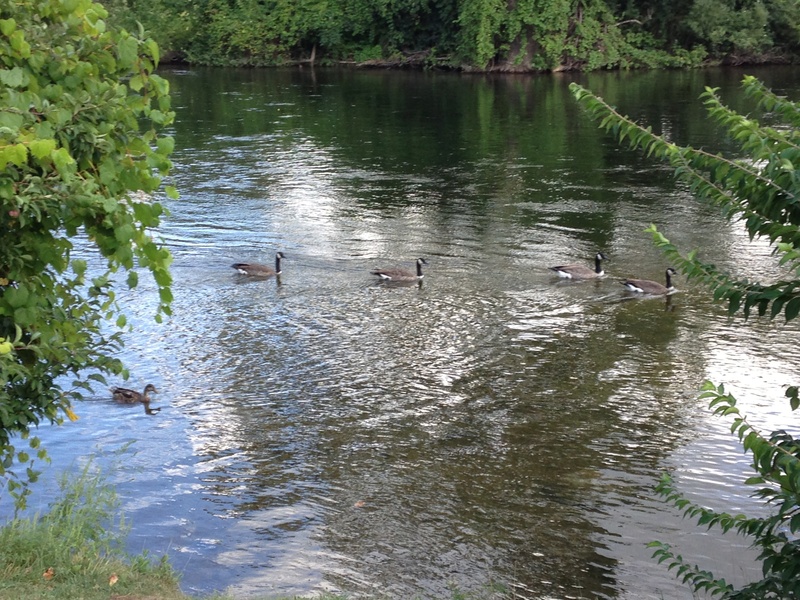 We were also followed part of the way by a family of ducks! Rafters must feed them because they swam right up to us and we easily could have reached out and touched them if we felt the urge. I didn’t bring my phone/camera for fear of getting it wet, but on a subsequent walk through the parks along the edge of the river, I took some shots of what we basically saw. Here are some photos of the route, the wildlife and some other boaters. I didn’t alter any of these photos…the sky is really this blue and the clouds are really this puffy. 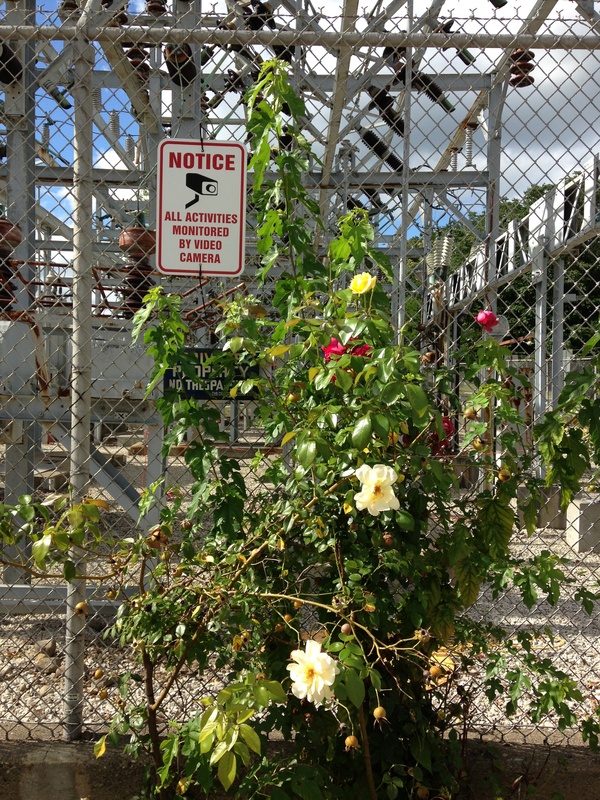 This scene of the flowers against the fence reminded me of a story my mom tells about when she was backpacking in Europe and learned to say one thing in Russian: something like “the lilac-colored forget-me-nots grow next to the hydroelectric plant.” Is that right, Mom?